he second Martin D-45 ever made was custom ordered by a 12-year-old singing cowboy from Milwaukee, Wisconsin, named Jackie "Kid" Moore. The first was built for Gene Autry a year earlier in 1933. Moore was a great guitarist who gave Autry guitar lessons and borrowed his D-45 for a performance. He liked it so much that he ordered one for himself. Moore paid $360 for his D-45, $160 more than what the standard model would cost a few years later (Martin would not build another D-45 until 1936). Moore's guitar was thus the most expensive prewar D-45 ever made. It featured a solid, pearl-bordered headstock inlaid with the vertical C.F. Martin logo (Autry's had a slotted headstock with a torch inlay); gold-plated Grover G-111 gears engraved with M's; and an ebony fingerboard with "Jackie Kid Moore" inlaid in high-grade white pearl. The guitar is X-braced and built of a red spruce top and Brazilian rosewood back and sides. Its OM-profile, 12-fret neck makes it extremely playable. The guitar has an ebony truss rod and bridge with ivory bridge pins inlaid with abalone dots. 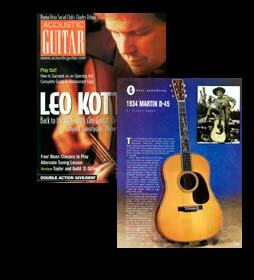 Moore requested that Martin stamp a secret serial number inside the guitar for security reasons. As it turns out, the guitar was stolen only three years after it was built, nut it was anonymously returned in 1945 when Moore returned from World War II. The instrument is now owned by Hank Risan.